The goodfirm ICBC lawyers want to explain a recent car accident where a woman was struck at an unmarked intersection and found partially responsible. In Olson v. Farran, 2016 BCSC 1255, Mr. Justice Pearlman for the British Columbia Supreme Court found a plaintiff partially at fault for a crosswalk accident. Ms. O was walking to work when she was struck at an unmarked road crossing at a roundabout and ended up on the hood of the defendant’s car. At the time, the plaintiff had been talking on her cellphone. The defendant alleged that Mrs. O was also at fault for the accident. In assessing whether the plaintiff was also at fault, Mr. Justice Pearlman reviewed Motor Vehicle Act and the law on obligations of drivers and pedestrians in crosswalk accidents. He noted four cases that dealt with liability of a pedestrian. Paskall v. Scheithauer, 2014 BCCA 26, where a defendant was found 100% liable for hitting a pedestrian at a crosswalk. The pedestrian was found to have looked both ways before crossing and the court found it was not unreasonable for the plaintiff to believe the defendants vehicle would stop at the cross walk. Pickering v. Insurance Corp. of British Columbia, 1985 CarswellBC 1346 (S.C.). defendant struck a plaintiff at an unmarked crosswalk and was 100% liable. 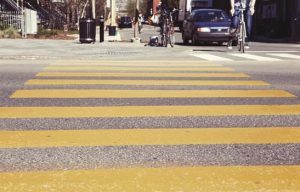 The plaintiff, having entered the crosswalk lawfully, was entitled to assume that approaching traffic would yield the right of way. Bell v. Thorner, 2009 BCSC 44. A defendant struck a plaintiff at night at an unmarked crosswalk. The court found the plaintiff also at fault as the pedestrian was wearing dark clothing and had not adequately checked for oncoming traffic. The court found he did not take reasonable care for his own safety. Cairney v. Miller, 2012 BCSC 86, A defendant struck a pedestrian in a crosswalk was found entirely at fault. The pedestrian who was walking in the crosswalk observed the defendant’s car slow as it approached the intersection. The court found it was reasonable for the pedestrian to expect the defendant would have seen him. After reviewing the authorities, Mr. Justice Pearlman found that the defendant was negligent in entering the roundabout intersection without paying enough care and attention for pedestrians crossing her path. However, he also found the plaintiff negligent as she had failed to check whether the oncoming traffic in the roundabout was a risk to her safety before she entered the unmarked crosswalk. Mr. Justice Pearlman also found that the plaintiff was distracted by her phone conversation, even though it she was speaking through ear buds. Ultimately Mr. Justice Pearlman found the defendant 75% at fault and the plaintiff 25% at fault and awarded $92, 874.24 for her injuries.